Shop Smart offer: 2.5% discount off our standard price for Shop Smart cardholders. Please check in shop for further detail of what is available. The shop supplies food and accessories for dogs, cats, small mammals, birds, tropical and coldwater fish, and reptiles. I have Rabbits, Guinea Pigs, Hamster, Gerbils, small birds, and fish for sale. For these animals I have a variety of hutches, runs, cages, and fish tanks. Weighing 1-2 kg bags out from large sacks means cheaper mammal, wild and caged bird seed. If the shop does not stock certain items, I will order them in my next wholesale delivery. I do free deliveries, for bulk orders, to Caterham, Chaldon, Old Coulsdon, Godstone, Oxted, Warlingham, Woldingham, and Netherne. 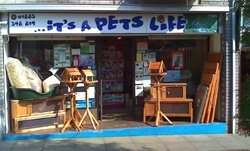 Tel 01883-348814 and email itsapets.life@virgin.net. Normal Opening Hours: The shop is open 7 days a week - Mon-Sat 9am-5.30pm and Sunday 10am-4pm.